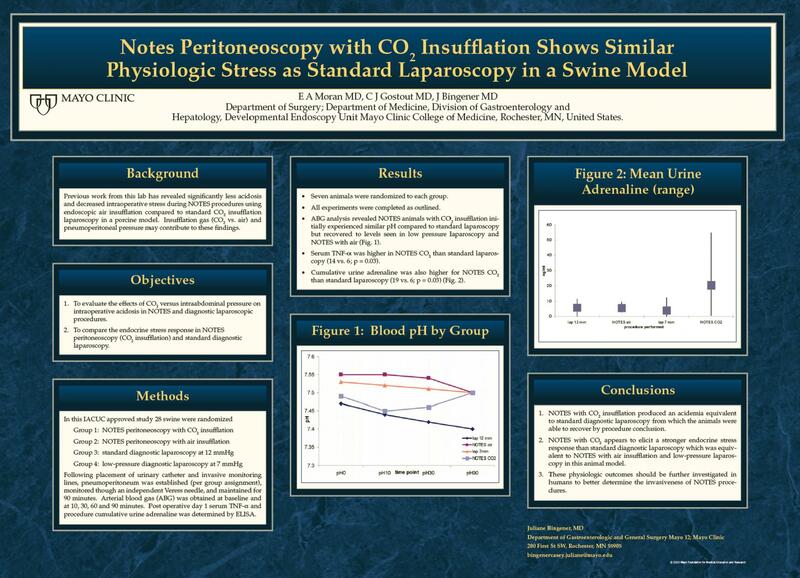 NOTES Peritoneoscopy with Co2 Insufflation Shows Similar Physiologic Stress As Standard Laparoscopy in a Swine Model. Introduction: Previous studies have reported less acidemia and decreased intraoperative stress during NOTES procedures using endoscopic air insufflation compared to standard laparoscopy in a porcine model. Insufflation gas (Co2 vs air) and pneumoperitoneal pressure may contribute to these findings. Objectives: 1-To evaluate the effects of CO2 versus intraabdominal pressure on intraoperative acidosis. 2-To compare the endocrine stress response in NOTES peritoneoscopy (CO2 insufflation) and standard diagnostic laparoscopy.Methods and Procedures: Swine were randomized as follows—Group 1: NOTES peritoneoscopy with CO2 insufflation; Group 2: NOTES peritoneoscopy with air insufflation; Group 3: standard diagnostic laparoscopy at 12 mmHg; Group 4: low-pressure diagnostic laparoscopy at 7 mmHg. Following placement of urinary catheter and invasive monitoring lines, pneumoperitoneum was established (per group assignment), monitored though an independent Veress needle, and maintained for 90 minutes. Arterial blood gas (ABG) was obtained at baseline, 10, 30, 60 and 90 minutes. Post operative day 1 serum TNF-α and procedure cumulative urine adrenaline were determined by ELISA.Results: Seven animals were randomized to each group. All experiments were completed per randomization. ABG analysis revealed NOTES animals with CO2 insufflation initially experienced similar pH as those undergoing standard laparoscopy but recovered to levels seen during NOTES with air insufflation and low pressure laparoscopy (Fig. 1). Serum TNF-α was higher in NOTES CO2 than standard laparoscopy (14 vs. 6; p= 0.03). Cumulative urine adrenaline was also higher for NOTES CO2 than standard laparoscopy (19 vs. 6; p= 0.03). Conclusions: NOTES with CO2 insufflation produced an acidemia equivalent to standard diagnostic laparoscopy from which the animals were able to recover by procedure conclusion. However, NOTES with CO2 appears to elicit a stronger endocrine stress response than standard diagnostic laparoscopy which was equivalent to NOTES with air insufflation and low-pressure laparoscopy in this animal model. These physiologic outcomes should be further investigated in humans to better determine the invasiveness of NOTES procedures.